Zakaria Zubeidi told a Palestinian court in Jericho on Monday that he would not eat, drink or speak until he is released, after his four-month detention without charge was again extended. During the second intifada and Israeli invasion in 2002, Zubeidi led the Fatah-affiliated Al-Aqsa Martyrs Brigade in Jenin. 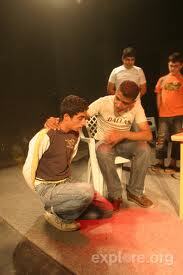 He left it to take up the cultural struggle, co-founding the Freedom Theater in Jenin refugee camp in 2006. Last Thursday, Zubeidi agreed to partially suspend his earlier fast by taking fluids, after he received assurances from a presidential delegation that he would be freed from Jericho civil jail in five days. Zubeidi was detained by PA forces on May 13 and his detention has been repeatedly renewed without charges being pressed. Witnesses said Zakaria warned the court “you will take a funeral from Jericho to Jenin in four days,” noting that he was looking gaunt and had trouble speaking clearly. He has refused food since last Sunday. Zubeidi’s lawyer Farid Hawash told Ma’an he regards the court decision as illegal as Zubeidi has already been jailed without charge for longer than is permitted under Palestinian law. Please see previous posting for suggested actions.